On August 25, 2017 Hurricane Harvey made landfall in Southeast Texas leaving low-lying areas under water, displacing thousands from their homes, causing catastrophic and life-threatening conditions according to the National Hurricane Center. 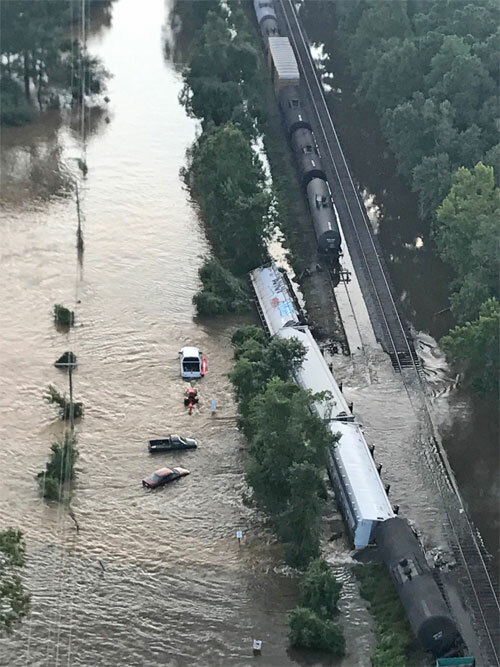 One area that got hit hard was Beaumont, Texas, as flash floods covered everything with water leaving thousands without power. Entergy, a major energy provider in Texas, contacted Air2 to help in the emergency recovery efforts, for which Air2 first deployed a MD 500 with a 5 man crew to the Beaumont area. The MD 500 crew restored line patrol insulators and conducted crossarm changes. In addition, Air2 subcontracted a K-Max from Swanson Aviation. The K-max crew has been on standby waiting for an assigned mission, as the recovery efforts continue. To date, Entergy Texas has restored service to nearly all customers in the Beaumont area that lost power during Hurricane Harvey. “The collaborative effort to re-energize these substations has been accomplished efficiently, effectively and without injury or incident,” said Dean Adams, senior grid manager for Entergy Texas. The rain and wind from Hurricane Harvey kept on moving inland, bringing yet more devastation to the Houston area. Thousands more were left underwater, without power. On September 5th Air2 was called to mobilize another MD500 and 5 man crew to Houston, for CenterPoint Energy. The Houston restoration efforts included cutting out jumpers on supply lines to a chemical plant on the east side, and performing line patrols. Air2 has extensive experience in Hurricane Recovery services, and has learned from each emergency situation which unique services and skills are required. When Hurricanes Gustav and Ike hit the Gulf Coast in 2008, and in 2005 Hurricanes Katrina and Rita struck Baton Rouge, LA and Beaumont, TX, Air2 was an integral part in bringing those areas back to life. Throughout all of these storm restoration efforts, one constant remains and that is the PLH Group Safety Core Value ensuring at all times that safety is a priority with every job throughout PLH Group and is ingrained in the way employees from each entity conduct their business and lives. The recovery from Hurricane Harvey will take years, and will be a monumental multi-level effort to rebuild, but rest assured Air2 is ready to mobilize and help get the job done.